64fe292167 – Today I found out about a rather unique event taking place this week. 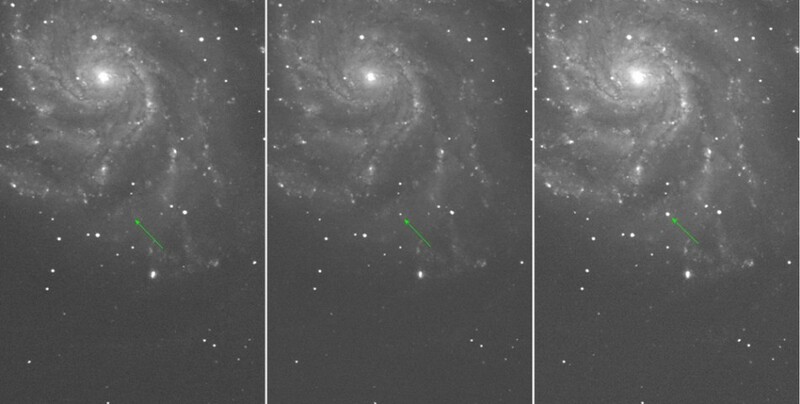 Astronomers from Berkeley have discovered a very young new Supernova relatively close to earth that they call PTF 11kly. The Supernova was discovered on August 24th and is estimated to be 21 million light years away from the planet Earth in the Pinwheel galaxy (Messier 101). Because of it’s close distance Astronomers are saying it could be visible with low magnification devices such as binoculars or a camera with a decent zoom. It is located in the Big Dipper constellation and it should be fairly straightforward to find at twilight in the Northern Hemisphere. This is also a big event for Astronomers since they were able to catch the Supernova’s beginning and will be able to observe it go through its lifecycle in the coming days. In the past Astronomers have only been able to see Supernova events after they had already begun. So being able to observe the event from the very beginning through its lifecycle is an important breakthrough that has been facilitated by the more sophosticated technology that is now available to Astronomers. I also find interesting the type of Supernova… it is called an Ia type which is a binary sun system where one sun is very dense (a white dwarf star) and is consuming its neighbor. The Supernova happens when the dense sun has consumed so much of its neighbor that its mass goes critical and the Supernova event is triggered. At this point Astronomers seem unclear on the future of the star that is going Supernova; ie: does it have enough mass to become a black hole, or will it become a neutron star? I will try to go out and see if I can spot the PTF 11kly Supernova happening. It will only be visible for another month before it is obscured for the next three months. I’d really like to catch a glimpse of this amazing and unique event! Hey Justin, did you get to see the supernova? Here, maybe because of the lower latitude, light pollution, and tall buildings, I wasn’t able to see it or the Big Dipper well. Hi Martin, I also didn’t get to see the supernova since it was quite cloudy here in the evenings. It would have been really neat to see, but I guess we’ll have to be content with looking at the photos others have taken. Google actually has quite an extensive collection of pictures people have taken of the SN 2011fe Supernova in their Google Images catalogue.